Enjoy this HUGE collection of solitaire games in amazing HD quality! Solitaire 220 Plus is a massive assortment of Solitaire varieties all presented in amazing HD quality. In this incredible collection, you'll find solitaire variants such as Freecell, Fan, Four Seasons, Klondike, Spider, Bakers Dozen, Canfield, Golf, Sir Tommy and many, many more. Featuring a helpful tutorial for each version you want to play,all of which can be looked up during gameplay. 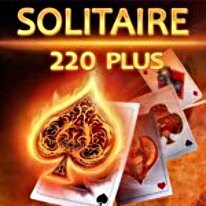 Solitaire 220 Plus offers a wide array of decks of cards, card backs and backgrounds. You can also display information on each card during the game if you desire. All this will ensure your mastery of all versions of this classic card game.